Greece’s crisis has challenged the Eurozone. China’s stock market is crashing. Emerging markets suffer as commodity prices plummet. But, what is gold’s fate? An investment historically lauded for its safety and security in tumultuous times, gold surprisingly faces adversity. Many think gold is dried up. In the midst of global economic uncertainty, if gold can’t rally, then it’s not worth your money. But, the naysayers fail to recognize a true crisis has not yet occurred. In reality, global markets are stagnating in a tranquil, almost unnatural. Perhaps gold is no longer a dependable store of value. Have bitcoin, land, or cash replaced gold’s refuge status? It’s too early to draw conclusions until we experience real crisis. Gold investors have seen better days. At the peak of the financial crisis, gold’s all time high was $2,000 an ounce, but the last few years of economic recovery have sent gold into a downward spiral. In the last month, the price has seen as low as $1,080 an ounce, and shows no signs of stopping. Low prices have discouraged miners from continuing operations, which become astronomically less profitable when gold’s price decreases. But, risk is a component of any potentially profitable asset– why is gold any different? The concern is not necessarily in the price drop, but rather the eccentricity of gold’s behavior. Amidst panic, gold generally increases, but it’s not. Has gold lost its “safe haven” reputation? For example, Greece stared into the abyss of an economy without the Euro, and a full-blown meltdown seemed inevitable. Never before has a country left the eurozone; the strength and scale of its implications are unknown. 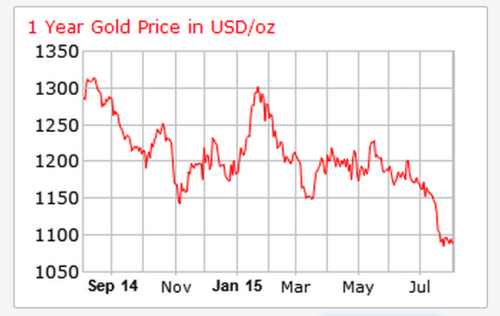 But, through the ordeal, the gold price remained unchanged. Additionally, China’s stock market has experienced highs and lows: speculative buying and a subsequent market correction. If China experiences an economic meltdown akin to the 2008 crisis, havoc will likely ensue, and no one is safe. Political tensions are also boiling: the Syrian Civil War, the Russian invasion of Ukraine, the Islamic State terror have all raised the question, is the economy safe? But gold is still silent. Analysts are losing faith in gold, but what does this mean for real estate? Real estate is usually categorized as an ‘alternative investment’, competing against countless other modes of investment, including precious metals, collectibles, and financial derivatives. Every year, Gallup and other poll sites ask Americans where they believe the best investment lies. Lower income Americans answered gold, while their higher income counterparts answered real estate and equities. Since the report (conducted in April 2014), gold has tumbled 18%. By contrast, real estate has slowly but steadily grown. There’s no denying that real estate has its fair share of risk. But, risk can be minimized by investing in stable investments (think core or core plus), investing in REITs, investing in small amount of money with a trusted investment platform, or a combination of the three. As gold loses its shine, alternative investors will likely turn to other alternative investments; these investors will not reallocate into stocks and bonds. Real estate will compete with art, coins, wines, and antiques, among others. Believe it or not, real estate is the most standardized and quantitative of them all, which will likely attract investors looking for a sound investment. Currently, there are no crowdfunding platforms for art, coins, wines, or antiques. With the rise of online real estate platforms, it’s easier than ever to invest. Gold’s one-year price changes, which reflect a rather steep decrease.